Drive Kanga TS is a fully configured pediatric tilt chair that only requires you to select the correct seat width. 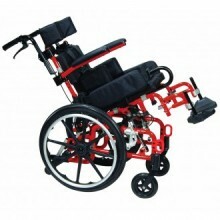 It has a depth adjustable seat, five-point harness, depth adjustable abductor, hip guides, lateral supports and curved headrest as standard features. Overall Width 18" - 22"
Click the button below to add the Kanga TS Pediatric Foldable Tilt In Space Wheelchair to your wish list.